Something a bit different this time… I have written a guest post about my favourite stationery for my blogging friend Shaz, for her Stationery Love feature on Jera’s Jamboree. This is the link. If you are not already following the blog, do explore the rest of Jera’s Jamboree, which has a lot to say about books but is also full of inspiration on all sorts of lifestyle subjects. I love it! If you play with Meccano do you grow up to be an engineer? 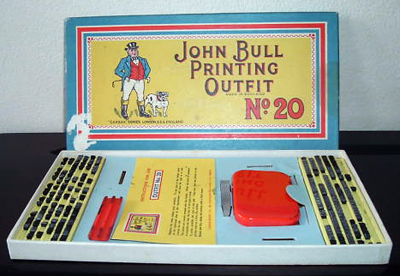 Did my childhood toys make me a journalist, or was it an in-born love of writing that made me ask for John Bull printing sets and a typewriter? 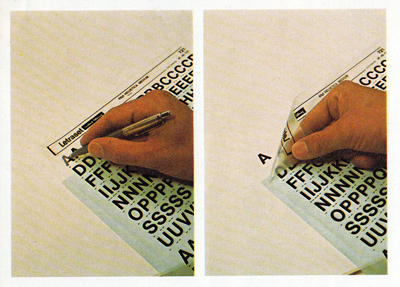 I still treasure a Letraset catalogue from 1974. I’m not sure why, as I never really got on with Letraset. If you don’t remember it, I had better explain that in those days it was a form of instant “dry transfer” “rub-down” lettering. And I never could get it lined up straight. Those were the days long before QuarkXPress (launched in 1987) and Adobe PhotoShop (launched in February 1990). As I pin my new wall calendar to my office notice board, I feel a need to share my feelings about the merits of push pins over drawing pins. I think Americans probably call drawing pins thumb tacks, which is reasonable, as you do press them firmly into place with your thumb. In the UK we call them drawing pins because they can be used to pin drawings to the wall. 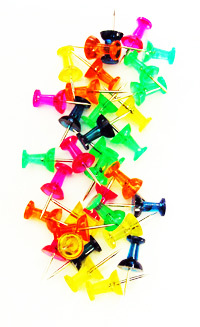 I grew up using drawing pins and discovered push pins only a couple of years ago, when I bought a small box of lovely rainbow-jelly-coloured ones for 69p from the Pound Shop in Ebbw Vale. I always like to treat myself to something when my work takes me out of town. I know they were 69p because I still have them in my drawer. They were too pretty to use. 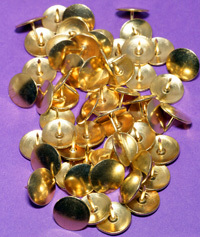 However, I did soon buy some plainer ones and I am now a convert to push pins. The worst drawing pins are those very thin, cheap ones that bend uselessly under pressure. Worse than that, when you try to remove them from the wall, their sharp heads cut into that tender flesh under your nails. Ouch! Although I admit that I recently found a very old box of nice thick brassy ones with milled edges that aren’t so bad in that respect. 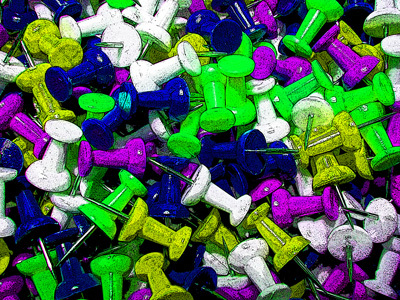 Drawing pins also tend to land point upwards if you drop them on the floor, while push pins just roll around. To be fair, there is a down side to push pins. They take a bit more pressure to stick into a stubborn notice board, as you can’t put your whole weight into it.